In this Wednesday, Dec. 5, 2018, photo, two layers of barbed wire fencing ring the "Hotan City apparel employment training base" where Hetian Taida has a factory in Hotan in western China's Xinjiang region. This is one of a growing number of internment camps in the Xinjiang region, where by some estimates 1 million Muslims are detained, forced to give up their language and their religion and subject to political indoctrination. Now, the Chinese government is also forcing some detainees to work in manufacturing and food industries. Some of them are within the internment camps; others are privately owned, state-subsidized factories where detainees are sent once they are released. The Chinese government lashed out Thursday at recent U.S. media reports about forced labor of mostly ethnic Muslim detainees in China's far western Xinjiang region. The stories are "a malicious attack that severely distorts the fact," Foreign Ministry spokeswoman Hua Chunying said at a daily news briefing in response to a question from the state-run People's Daily newspaper. "It goes totally against the professional ethics of journalism," she continued, before invoking President Donald Trump. "No wonder the U.S. leader has criticized the behavior of some U.S. media." The Associated Press and others have reported that Muslims detained in internment camps have in some cases been forced to work in factories. The AP found that clothing made in one camp had been shipped to an American sportswear company that supplies universities, colleges and schools. U.S. Customs and Border Protection said Tuesday it is reviewing information published this week by The New York Times, The Washington Post and The Associated Press that "for the first time appears to link the internment camps identified in Western China to the importation of goods produced by forced labor." It is against U.S. law to import products of forced labor. Hua said China has abolished re-education through labor and described the camps as vocational training centers that help families shake off poverty. 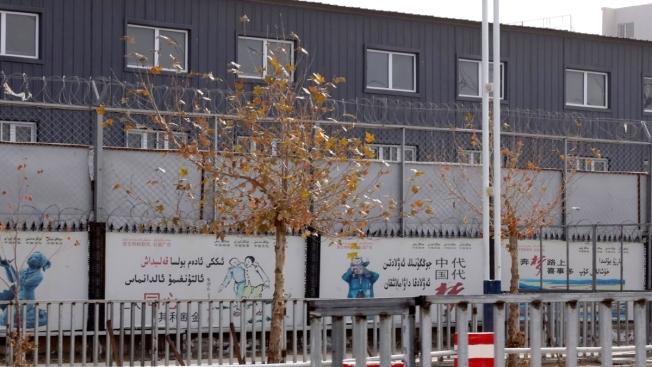 The trainees participate voluntarily, she said, contradicting former detainees and friends and relatives of detainees who have told the AP that they have no choice. "I would like to ask the relevant U.S. media, which criticize and demonize China's efforts in fighting terrorism and extremism and in poverty relief, what they have done in the face of 45 million Americans living in poverty and the severe discrimination issues at home," she said. China has turned Xinjiang, home to the predominantly Muslim Uighur ethnic minority, into a virtual police state to prevent violent extremism. It has locked up as many as 1 million people, by some estimates, in camps where they are forced to give up their language and their religion and subject to political indoctrination.